Repentant ex neo-Nazi Ingo Hasselbach's autobiographical experiences are the basis for "Fuhrer Ex". Two friends dream of escaping the oppression of communist GDR in 1980s in Berlin. When they finally make an attempt, however, they are captured by the authorities and imprisoned. In jail, they allow themselves to be indoctrinated into the hate-fueled neo-Nazi movement to try and survive their incarceration. The question is how much they will allow the ideology to dominate them once they've been released. "Fuhrer Ex" examines the value and costs of both personal and political comradeship. Produced by NHOAH for r.o.t. 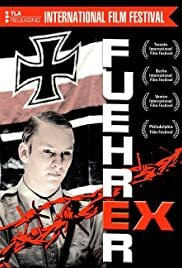 Führer Ex is a challenging, harsh, and intensely involving tale of the course of friendship of two young lads living in the 'prison' of Communist East Germany in 1986. Based on fact (Ingo Hasselbach's book 'Die Abrechnng' adapted for the screen by Douglas Graham and director Winfried Bonengel), this story relates the changes that occur in the close friendship of two boys torn by the confinement of the East German Communists vs the Western freedom of West Germany and the countries not under Communist control. It informs us about that transition with the fall of the Berlin wall and the subsequent adjustment to the new form of life East Germans found beyond the crumbled wall. Heiko (Christian Blümel) is fair-haired, virginal, nice guy who longs for adventure (and more) with his idolized friend Tommy (Aaron Hildebrand), an edgy guy unafraid to get into a bit of trouble (Tommy is arrested for a minor crime and is released from jail shaved and tattooed). The two dream of escaping their rigid lives and fleeing to Australia. Tommy talks Heiko into running the risk of actual escape and together they break through the wires and walls that confine them but are apprehended in their attempt and sentenced to prison in a cruel Communist prison where they are separated, Tommy joining a 'neo-nazi' group and Heiko falling under the 'protection' of a fellow prisoner who eventually rapes him. The two finally are able to talk and plan a mutual escape, hopefully placing themselves in boxes to be transported to freedom. Tommy succeeds; Heiko doesn't and remains in prison. Flash forward to 1989 and the Berlin wall is down. Tommy is living a comfortable life in the new Berlin and encounters Heiko in a true Neo-Nazi meeting that Heiko is leading. The tables have turned - Heiko is the miscreant and Tommy is the good guy. Convinced that Tommy is a traitor to the ideals of Heiko's political interests, Heiko surfaces all of the hate that brewed in prison and is focused on unjust governments. An event occurs that alters their friendship and Heiko is forced to see that varying political climes and convictions pale in the value of treasured friends.